Amazingly Fast, Surprisingly Earth-Friendly A Revolution in Disinfection • Kills bacteria and viruses in as fast as 30 seconds – disinfecting and powerful one-step cleaning. 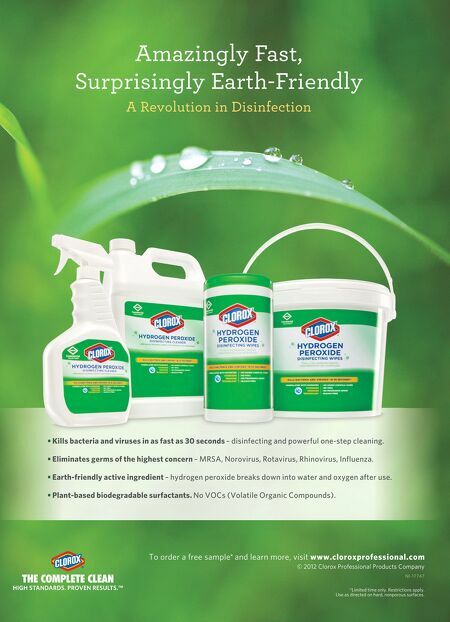 • Eliminates germs of the highest concern – MRSA, Norovirus, Rotavirus, Rhinovirus, Influenza. • Earth-friendly active ingredient – hydrogen peroxide breaks down into water and oxygen after use. • Plant-based biodegradable surfactants. No VOCs (Volatile Organic Compounds). To order a free sample* and learn more, visit www.cloroxprofessional.com © 2012 Clorox Professional Products Company NI-17747 *Limited time only. Restrictions apply. Use as directed on hard, nonporous surfaces.